A free workout program for the world's busiest person - YOU! 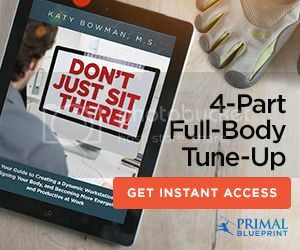 A free workout program for the world’s busiest person – YOU! The single biggest barrier that I hear when it comes to getting into shape is the lack of time. People are busy, and carving out hours per week to go to the gym is so low on the priority list that it’s, realistically, never going to happen. 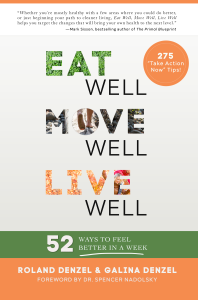 Note – The No Time To Workout Workout is now known as 25 Minutes to Fit, and is available on Amazon, Nook, Kobo, and Apple. For a limited time, the old, pdf is still available for download, but for the latest and greatest, buy the book here. And what happens when you only have 30 minutes a day? Do you just stop exercising? When you are new to the training game and want to put on a little muscle, feel better, stronger, leaner, it seems like there is never a simple solution. The truth is, you’ve been lied to, both by the people who tell you that you merely have to walk more and by the people that point to bodybuilding magazines and tell you that you need to hit the gym 5-6 times per week. Lies, all of it. 10 years back, I remember looking at my Palm Pilot 1000’s crowded calendar and trying to find time to squeeze some gym time into that little screen. Between things for the kids, work, church events, and my commute, it didn’t look good. There was no way that I could find the time. Back then, I had no idea what to do and I wish someone had handed me a program just like this. Click to download your free 50 page workout ebook for people with NO TIME! A great workout in as little as 30 minutes! 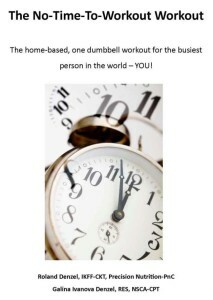 Have an amazing workout at home with just one dumbbell! To download your workout program, click the cover image to the left, or just click HERE. *%#*&%$! I left my lunch at home! Zucchini blossom omelet – yes, really! i might be way over in NH, but you guys are super important people in my life. looking forward to checking this out.